U.S. Youth Futsal’s new Academy Program raises the bar on youth Futsal in the USA. Futsal is a beloved game that provides many touches on the ball and has a unique set of rules to enhance player development and enjoyment. The development Academy was established to standardize the US youth Futsal curriculum, and give futsal players a true pathway. 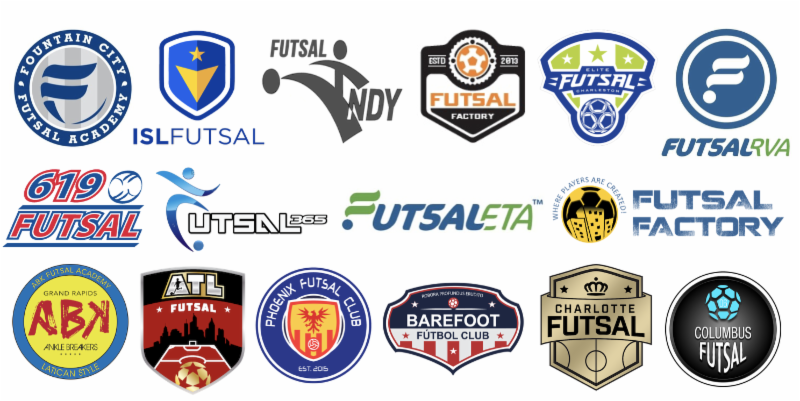 To support the growth of Futsal and continued player development Barefoot & Futsala are joining forces to offer an additional new training program for the most dedicated futsal players. The two player centric organizations will be combining our Development Academies to into a single Academy training program. This program will offer a powerful dual training emphasis combining European Futsal and South American Futsal training techniques to enhance player development. The program will provide year around Futsal training to be completed along side a player’s current outdoor club training. Players will train once a week during the fall and spring, and twice a week or more during the winter. Being a part of the Development Academy will give players Futsal exposure on a National level. Development academy players will train year round in the heart of the city. The curriculum will be lead by Coach G, a staple in Charlotte for the past 10 years, and Santi Gea, who is the former FC Barcelona Futsal coach, and current Director of the Catalan Futsal Federation. It is an honor to have two pioneers of the game on board as the figureheads for our joint program. Our development academy players will have fluid connection to the US Youth Futsal National pathway and will find themselves under constant observation of National team staff, college, and professional coaches throughout the year. Being a part of Barefoot – ISL Futsala will give players national exposure, and elite competition. We will compete in a number of tournaments and ID sessions year round, which will expose our players to national team staff, and better their futsal education. Players will have a full year round program, training 52 times throughout the year. This will maximize their future potential in the game of futsal, and breed a true passion for the sport. Coach G who has lead the Futsal revolution in Charlotte will be setting our methodology alongside Santi Gea, who has reached the top of European futsal. Our Development Academy players enjoy the fusion of two player centric organizations. We put our players first, and their development on and off the field is what we strive towards. The 2018 - 19 Program Starts Sunday, August 26th. Time details for each age group will be announced soon. Barefoot and ISL Futbol Clubs are joining forces to offer one of the most competitive and training intensive Futsal Developmental Academies our country has to offer. ID trials for the Barefoot - ISL Futsal Development Academy are listed above. Our teams will train year round and compete in local, regional and national events. Our Development Academy players will be exposed to coaching from Colombian National Team Players and Professional Futsal Coaches from Spain. Barefoot - ISL is authentic and diverse futsal. As with the rest of our offerings, the Futsal Developmental Academy is designed to co-exist with an elite player's outdoor club commitments. The Academy Program is U.S. Youth Futsal's most recent program. USYF is expecting the program to expand throughout all Regions of the US in 2018. This program is offered to players born 2000 - 2007. Academy teams will be selected through a tryout process. Players will attend a year long training program in facilities with USYF standards. Academy Players are coached by the best Futsal Coaches in the area. The players have a direct connection to the U.S. Youth Futsal National Staff allowing them to be seen and invited to I.D. Trials including National I.D. USYF Academy Players will get a chance to be observed by other coaches ( Club and College) in different Showcases. OVERLAND PARK, KS - June 7, 2018 -A new era for Futsal in the USA began today as US Youth Futsal (USYF) announced the launch of its new Academy program. The US Youth Futsal Academy program will powerfully impact and improve youth player development in the United States. "We are thrilled to launch the US Youth Futsal Academy," said Jon Parry, Executive Director of US Youth Futsal. "We believe this is an important step towards developing world class players in America. We are proud that many of the country's top former futsal national team players are now USYF Academy Directors." Setting the standard for elite futsal training and competition in the USA, US Youth Futsal's nationwide Academy program will improve player development by providing high quality and consistent futsal training environments, meaningful futsal competition and coaching education. "The goal is to produce players of exceptional ability in both soccer and futsal," said Joe Farrell, USYF Academy Executive Board and Executive Director & Co-Founder, FutsalRVA. "The USYF Academy is designed for players who want to participate in high-level technical and tactical futsal training and competition. The Academy structure will complement - not compete with - a player's club training in order to optimize schedules and maximize development." The Futsal Academy offers players a unique opportunity to develop and compete in a year-round futsal centric environment alongside of other dedicated and skilled players from a variety of youth soccer clubs. "Futsal is paramount for player development in the USA," said Greg Simmonds, USYF Academy Executive Board and President, FutsalRVA. "The USYF Academy Program will provide environments where players are afforded opportunities to play and receive exposure on local, regional and national platforms." With a focus on training and development over competition, Academy teams will have the opportunity to compete in meaningful games against the best in their regions in USYF Leagues, Showcases & the Championship Series. "Our goal is to utilize our Academy's curriculum and structure to equip our players with the enthusiasm, courage and skills to flourish, be creative and to overcome any fear of failure," said Soorena Farboodmanesh, USYF Academy Director. "The USYF Academy will provide our players with events that maximize exposure and continue development." In the USYF Academy's second, year there must be U10/12/14 and High school for both girls and boys. In year three, each academy must have all age groups, from U10-HS, boys and girls that train year round. In the 2018/19 USYF Academy season, academies will play in five geographic regions across the USA. Every Academy will provide a minimum of one futsal training per week for at least 10 months. USYF received interest from over 100 applicants when it first launched its application process for the Academy. "We were looking for very progressive, forward-thinking futsal experts who will work closely together to grow the sport and impact how talent in the US is cultivated," said Farrell, who said this is just the first wave of Academies. USYF will look to expand its program to include additional clubs that meet the strict criteria for development - and want to offer a real pathway to developing technical players.